Also known as Pasta Puttanesca. 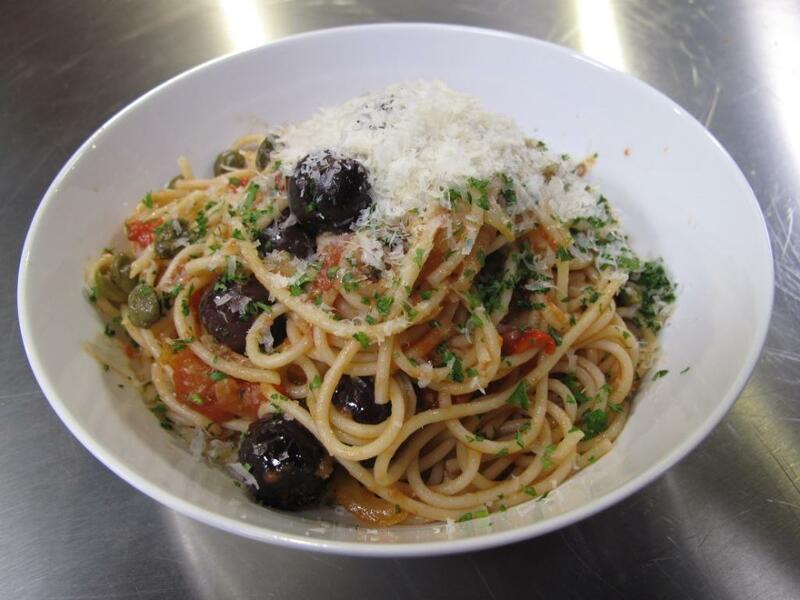 Set aside some of the capers and olives for garnishing the dish. In a small saucepan, bring the tomatoes to the boil and simmer for ten minutes. Heat the olive oil in a frying pan over a medium heat and add the onions and cook for about 5 minutes. Add the garlic and anchovies and cook until the anchovies break down and form part of the sauce. Add the chilli, capers, olives, tomatoes, sea salt and freshly milled black pepper, and heat through. Cook the pasta while you are cooking the sauce, drain it and reserve a little of the cooking water. Place the sauce in the bottom of the pasta pot. Put the hot pasta on top and toss well, adding a little of the cooking water if required. Place in a serving dish and garnish with the chopped parsley and the capers and olives you set aside.